A few months ago a friend emailed to say that he’d searched for me on twitter and found twenty accounts using my name, photo, and bio. I looked, and he was right: I was being impersonated. 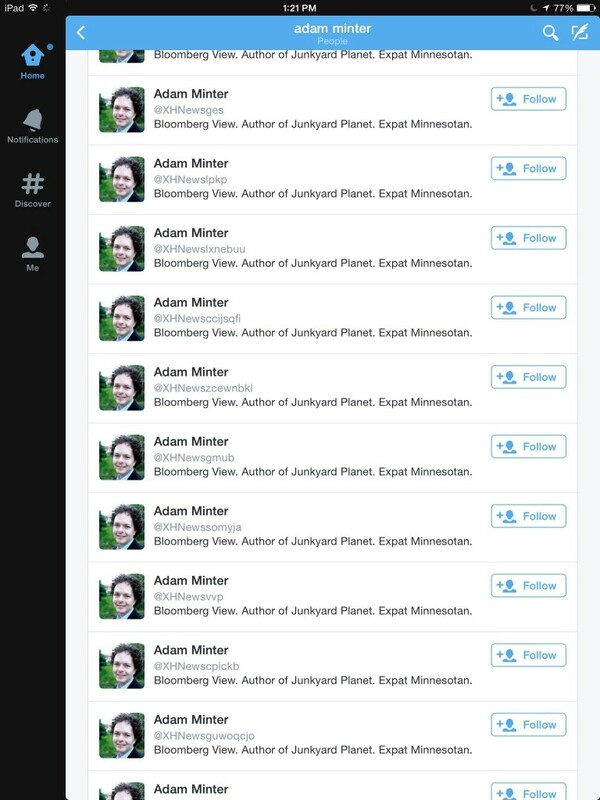 But here’s the thing: the actual twitter handle – the thing that starts with an @ – wasn’t some permutation of @adamminter. Rather, it was always @XHnews plus some random string of letters. As many of my readers know, @XHnews is the official, verified account of Xinhua, China’s state-owned news agency, purveyor of news and propaganda to the world. Why would someone want to make a mash-up of me and Xinhua? I have no idea. But anyway, Twitter doesn’t make it easy to get rid of these accounts – you have to fill out a form for each one. Still, once I finished complaining about the first, I couldn’t stop, and after 20 minutes or so I’d dutifully complained about each Minter/Xinhua mashup, and a few days later they were gone. Or so I thought. Chinese want to leave China like Ecuadorians want to leave Ecuador. Seems convincing, no? Well, no, and I’ll do my best to show why by answering three simple questions. Let’s be clear about what Krugman is implying here: Michael Pettis, noted skeptic of China’s economic prospects, has been transformed into a Viagra sales platform by “someone” who doesn’t like his economic analysis. .Who is that “someone?” Krugman won’t won’t say, but in this age of state-sponsored hacking it shouldn’t be too hard to connect the dots to … the Chinese Communist Party and its platoon of Viagra salesmen? That’s a reasonable, fact-based explanation, even if it leaves open the possibility of something far more serious. Krugman, if he hopes to avoid becoming a cartoon of himself, would be well-advised to learn from it. The link Rich shared is here. I can understand that the NYT doesn’t want to send out an official release telling Mike Daisey and his delusional supporters to stop citing its ieconomy series as factual backup for Daisey’s lies. But it sure would have been nice if Ira Glass, during his interview of ieconomy co-author Charles Duhigg during the retraction episode, had asked him even one question about Daisey. Did that material hit the cutting room floor? No idea. Does Duhigg think that his work supports Daisey? Surely, he could say something. And so could, for that matter, Duhigg’s co-author, David Barboza in Shanghai. Over the weekend, David Barboza sent me an email in which he responded to these observations and questions. With his permission, I’m publishing it, below. I read your column about Mike Daisey today and thought you’d like to know my own impression. I was supposed to be interviewed by Ira Glass. But after they talked with my colleague Charles Duhigg, they cancelled my session saying they had plenty of material. What I would have said is that Daisey’s fabrications were utterly ridiculous. He should never have been treated as a journalist. I heard large parts his performance on This American Life. He’s a talented story-teller, but I was a bit surprised they used his segment as a piece of journalism. I did not hear the entire show, but what I heard sounded far-fetched. He mentioned, for instance, meeting a 12 and 13-year-old at Foxconn’s gates. That just seemed highly unlikely to me. I’ve been to Foxconn gates in Shenzhen (and also got an official tour of the facility and its dormitory complex) many times and you can’t easily meet 12 or 13 year old there. And if you did, it’s unlikely they’d admit to being an underaged worker. I mentioned some of this in a Facebook chat I did shortly after our Apple i-Economy piece was published. Rob Schmitz of Marketplace certainly produced a piece of first-rate journalism. I wish I had done that work myself, since I too had suspected that Daisey fabricated large parts of his story. Anyway, you posed good questions in your essay. Ira Glass and the producers of This American Life should have asked Daisey whether he had photographs of his visit? How exactly did he find a translator? Were there any emails with his translator? What factories did he visit? What about hotel receipts? I don’t know what questions they asked, but I would have pushed him on those details and others. Editors don’t generally ask such questions of journalists they trust, but when the person is not a journalist, and the story just sounds a bit too good to be true, it would seem natural to ask. My Take on Mike Daisey and Ira Glass. In the week since Rob Schmitz’s outstanding debunking of Mike Daisey’s fabricated tales of Foxconn, I’ve been contemplating what – if anything I should write about this matter. Back in February, regular readers of this blog may recall, I appeared with Daisey (and two other guests) on To The Point with Warren Olney (downloadable here). Afterward, I was so bothered by, and suspicious of, Daisey’s blustery rage that I took the time to blog about it, here. Since then, I’ve been tempted to write again. But in the aftermath of Rob’s report, so much good (here and here, to start) has been written about the Daisey affair that I decided that there really wasn’t any need for anyone else to say anything about it. Then, earlier this week, Sam Gaskin of Time Out Shanghai asked me if I’d do an email interview on the subject, and that got me thinking about it, again. You can find that interview, here. I’m not often in the habit of quoting myself, but I’m going to indulge the temptation just this once, if only to highlight, for the record, on my own blog, what I feel about this matter. Ira Glass made it clear in interviews that he was interested in Mike Daisey’s monologue as a means of humanizing what he already believed to be a problem. So, rather than commissioning journalism for the purpose of getting at facts, he in effect paid for a monologue that confirmed what he already believed to be facts. That’s the only way that I can explain why he didn’t drop the story after Daisey claimed he could not provide TAL with the contact information for his translator in Shenzhen. At any other fact-checked news organization, that’d be enough to kill the story. But TAL wanted this story badly, and so drifted away from the normal standards of a fact check. Or, as Daisey himself wrote on his own blog: “You certainly don’t need to listen to me. Read the New York Times reporting.” This is only kind of sort of true. The New York Times, in its series on Foxconn, didn’t claim to find 12 and 13-year-olds outside of Foxconn’s gates. Nor did it come across Chinese union organizers sipping lattes at Starbucks. I can understand that the NYT doesn’t want to send out an official release telling Mike Daisey and his delusional supporters to stop citing its ieconomy series as factual backup for Daisey’s lies. But it sure would have been nice if Ira Glass, during his interview of ieconomy co-author Charles Duhigg during the retraction episode, had asked him even one question about Daisey. Did that material hit the cutting room floor? No idea. Does Duhigg think that his work supports Daisey? Surely, he could say something. And so could, for that matter, Duhigg’s co-author, David Barboza in Shanghai. In any event, there seems to be an evolved consensus that the New York Times has written the definitive account of Foxconn and its labor practices. To be sure, they wrote a long account. But if you’re interested in a deeper and more complex account of what life is like in and around Foxconn, then I strongly encourage you to click over to “Now Can We Start Talking About the Real Foxconn?” by Bloomberg’s Tim Culpan. Culp’s piece is based on years of reporting, and offers a far more nuanced view of life in a Chinese high-tech manufacturing facility that what Ira Glass and his producers wanted to believe. It’s the kind of story that This American Life should have done, if only because China – the real, truly complex China – is something that American readers, listeners, and viewers are going to need to understand, and the sooner the better. Idiotic, agenda-driven broadcasts like the one featuring Mike Daisey don’t advance that cause. Not one bit. My Time Out interview is here. The school building is over 40 years old. The school has only one Advanced Placement class and the school maps date from the Cold War era. Millinocket is isolated. The closest mall and movie theater is one hour away. The town gets 93 inches of snow per year. Millinocket has about 5,000 residents but has experienced increasingly hard times since its paper mill filed for bankruptcy eight years ago. There were about 700 students at the high school in the 1970s. Today there are about 200?and the biggest kick for kids is hanging out in a supermarket parking lot. Context: Millinocket, Maine has an active international students program in its public schools and, over the last year, it’s been covered by several media outlets, including the AP and the New York Times (indeed, the Global Times story lifts language, unattributed, from the Times’ story). The Global Times editorial argues that Chinese parents are better off sending their children to elite Chinese schools, rather them to international programs like the one in Millinocket, Maine – especially if they want their children to attend elite American colleges. It’s the kind of thing that the Global Times, once described by James Fallows as “the pro-Communist Fox News of China“, likes to run, especially when – as in the case of this editorial – it’s written by an American. The Bureau Chief’s Wife Doth Not Protest In Chinese. A couple of quick points regarding the brouhaha over last week’s New York Times’ story suggesting that China is censoring the use of the word ‘protest’ – both English and Chinese – in phone conversations. My post debunking this odd anecdote can be found here; it’s generated far more attention – and emails, phone calls, and DMs – than I ever expected. Some have questioned whether the issue is really so important. Well, from my perspective it is: insofar as the New York Times’ China correspondents hold the most important and influential foreign media jobs in China, their stories, standards, successes and failures, reflect on all foreign media in China. And, for better or worse, this ‘protest’ story does, too: from now on, it will be one more example for foreign media detractors to use as proof that “foreign media lie/make stuff up.” But forget the China-centric viewpoint: a very large percentage of the visits – and correspondence – generated by that post are from American with little interest in China, but a great deal of skepticism about the credibility and intentions of the American media. As someone with a personal interest in the credibility of American media, I have two (hopefully) last points that I’d like to make on this issue that I haven’t seen covered elsewhere. Shanghai Scrap is the personal blog of Adam Minter, Shanghai correspondent for Bloomberg World View and author of Junkyard Planet: Travels in the Billion-Dollar Trash Trade, forthcoming from Bloomsbury Press. All views expressed here are his own. Anatomy of a Myth: the World's Biggest E-Waste Dump Isn't. Wait a second - the US Census doesn't count Americans abroad? Where [some of] Hong Kong's old computers go to die. Shandong to Dead Workers: Blame Yourselves. Watsons Malaysia Isn't Safe for Shopping or Social Media - a Shanghai Scrap investigation.